The first images from the next wave of Kishiryu Sentai RyuSoulger merchandise have hit the Internet, revealing some remarkable new entries for the Dino Knight Super Sentai! 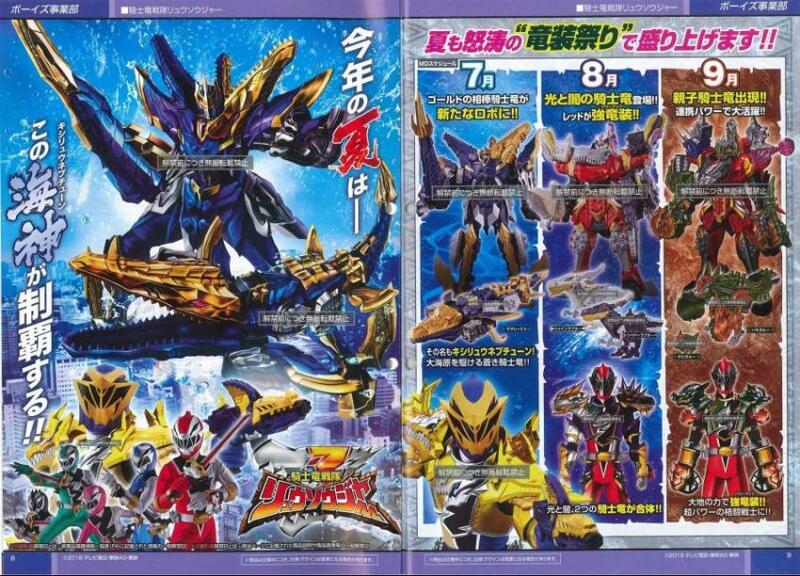 Highlights from this new catalog include: *The personal Kishiryu of the Sixth Ranger, RyuSoul Gold! This newcomer is a Mosasaurus-based figure called MosaRex! MosaRex can combine with the previously revealed DimeVolcano for a battle combination known as SpinoThunder. *MosaRex also has a unique battle configuration- KishiRyu Neptune! This Mecha is armed with a pair of mini-drones known as AmmoKnuckles– which appear to be based on ammonites. KishiRyu Neptune & KishiRyuOh can combine to » Continue Reading.